ClayTrader Review 2019 – Not Your Way To Ultimate Wealth! ClayTrader? Who or what is Clay? Here is nothing about an industry site targeted clay production. ‘Clay’ is the head trader of the ​service I´m reviewing. In this ClayTrader review, I’ll dig deep into the operations of this platform including its owners, the trading styles, products, services, and cost. Besides this, you will learn more about my personal opinion of the platform and how it does compare to other trading course providers. Is ClayTrader scam or not? Let’s begin with the people behind this brand. “Clay Trader” presents himself as a nice down-to-earth guy next door to whom his family and friends mean a lot more than a fancy car, millions of dollars and the so-called Wall Street Lifestyle. Clay Trader is a platform that offers day trading for beginners and chat room services to technical traders. Despite being a paid service, the platform makes use of its social media platforms to share useful trading tips to its community of followers. I found out that Clay is an engineering graduate from Ohio State University ​where he developed a keen interest in the stock markets during his early university days. Update: One of my readers (Thank you very much for your suggestion) told me that google plus has the real name of clay on it. The real name of ClayTrader is Clay Huber - according to his google plus profile. His journey in trading apparently started off with him selling mutual funds in 2005 leading to a thriving career in day trading. As he likes to tell his initial trading journey, he started off as an emotional trader which mostly ended up in him losing money. Today, he believes he trades strategically, relying on facts and figures from his technical analysis methods and past experiences. ​Clay and/or it's team are active contributors on investorshub but other that, its records get a bit fuzzy as you’ll notice by the end of this review. ClayTrader’s core trading styles revolve around swing trading and intra-day news trading momentum. The platform features a weekly newsletter that presents an average of six potential candidates for swing trading and day trading. Other than concentrating on small-caps, they also trade medium and large caps through options. Clay’s chatrooms are essentially made up of technical set-ups which result in breakdown/breakout as well as news catalysts. Here, the news catalysts could be contracts, earnings reports, clinical trials, FDA approvals and rejections, and more. But notice that such stocks can be quite unforgiving when the momentum comes to an end. Shorting for profit: As a trader you can also make profits from falling capital markets. The so-called short selling is very popular when it comes to day trading stocks. With this approach you aim to sell an asset when you expect its price will fall by using some specific day trading strategies. ClayTrader is offering this course for $397. Too much in my opinion for just learning how to short stocks. 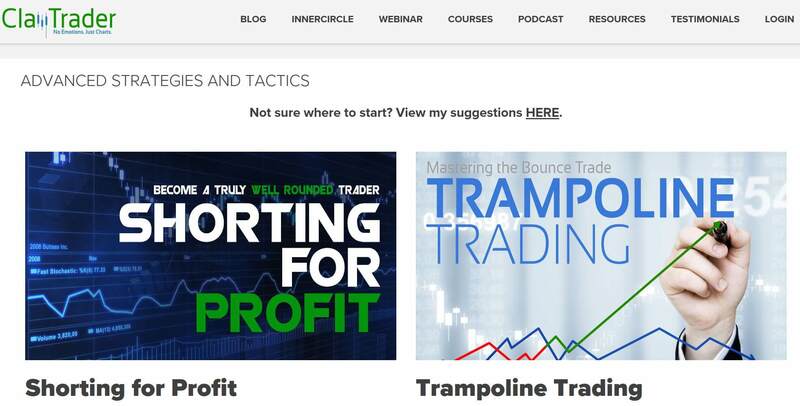 Trampoline Trading: This set-up is also known as ‘bounce back’ trading and is also quite popular among day traders. But by just giving it another name, the trading strategy itself does not change at all. It might be good for marketing, but it’s also based on Technical Analysis. The price for just one trading tactic of $297 is too high either. Volcano Trading: What is it that people don’t like with volcanos? Right, if the break out. This is another marketing strategy to sell an old trading strategy under a new name. This trading course for $297 is all about breakout trading, a normal day trading strategy. Clay’s argument is, that you learn the psychology behind it. For me, this is not a real guide, it sounds more like basic information that you can find for free on YouTube. Here’s a screenshot of what we established about ClayTrader’s use of these platforms. ​Despite these being the most popular trading tools for ClayTrader, there are other platforms utilized by Clay and his team. However, I noticed that most of those links are affiliate links. While this is basically okay, he completely misses to mention it that he gets compensation when someone uses these links. This lack of transparency is negative. The Inner Circle Trader is ClayTrader’s main product – in its simplest, the concept behind it advocates for surrounding yourself with the best for you to become the best. The Inner Circle grants you instant access to ClayTrader’s platform at an annual fee. The product also grants you access to exclusive newsletters, live chats and a message board forum. Currently, one also gets a 10% for every first-time payment made. However, the discount is not valid when signing up for ClayTrader University. ​ClayTrader Chart Room: this is the core part of the platform’s community and it allows members to exchange information in real-time. This is also the channel through which Clay and his team share daily trading alerts and other critical components of the trades. The live chatroom is exclusive to the Inner Circle members. ​Professional Forum: Clay ensures that all information that I exchanged in the chatroom is purely professional; everything discussed therein relates to trading. ​Power Profit Scans: This exclusive feature of the Inner Circle grants members access to Clay’s personal watchlists and scans. Networking: The Inner Circle members have a chance to mingle and build lasting relationships with fellow traders and regulators who can be instrumental towards shaping their trading careers. To be a member of the Inner Circle, you’ll be required to part with $99 per year. This package is only accessible after paying the fee as a whole for a year. The platform most has a 10% discount going on throughout the year so those signing up when the discount is still valid would be required to pay $89.10 only. However, while this price sounds fair, it is just a vehicle to upsell other products. ​This is the platform’s one-stop shop for all the day trading courses and materials that you need to trade professionally. Subscribers of the platform are granted access to insider knowledge to enable them to gain key trading skills as well as access to private forums. ​Money Saving: Being a one-stop shop for all the products and services offered by ClayTrader, you will save big as compared to purchasing them separately. At the time of this writing, buying all the products and services separately would cost $2,600 in total. However, when purchased together from ClayTrader University, one would save slightly more than $600. ​Permanent membership: The ClayTrader University subscription is a lifetime one; this means that you will always have access to the platform’s regulators such as Clay, and also the Power Point Scan weekly newsletters. Interactive webinars: ClayTrader offers live interactive sessions with their students to be able to tackle any specialized issues and concerns that might arise. Here, all topics related to trading are discussed in an in-depth manner and responses to queries are provided in real-time. ​Network: The ClayTrader University is said to have formally trained hundreds of traders and continues to do so. With all these and a lifetime membership, one can be able to build a network of like-minded professional traders. ​By the time I was writing this ClayTrader review, the total fee for the platform’s university membership had stood at $1,997. When surfing the web, you see that ​some people have termed this as the biggest ClayTrader rip-off, but still, some believe that the benefits mentioned above plus more are worth every penny. One thing is for sure, $1,997 is a word, and one has to be sure that he can make back this investment when he pays this price. Other than these two paid products, ClayTrader offers additional products that can be accessed by both paying and non-paying members. ClayTrader offers free webinars at a specified time of every week. For one to be a part of the webinar, they’ll need to reserve a spot in the alleged few slots of their webinar sessions. Those who attend the webinars learn a wide range of topics that enable them to trade without emotions or fear; emotion and fear, they say, is one of the core reasons why a trade might go south (well, at least according to Clay and his team). During the webinar sessions, Clay shares some of his biggest wins and losses in the trading business; it is through such webinars that he also shared how he started off as an emotional trader which led to some of his biggest losses in the trade. The webinars are not some ‘how to…or where to go to get rich quickly…or how to be a pro trader’; they are purely educative and experience-based to build the general knowledge of the platform’s day traders. So, how exactly do the webinars benefit the users form ClayTraders perspective? help members build the right mindset for a successful trading career and how to approach the market when it is in a bearish or bullish state. Trading videos are a core part of the ClayTrader platform; they play a key role in keeping its community of users updated on the latest trends in day trading. One of the most common platforms for sharing video content is the official ClayTrader YouTube channel and their official website videos. On YouTube, the platform has a community of servers to the tune of 150,000 subscribers. The podcasts are done by Clay himself with the help of a colleague known as Chezz. The duo, together with other community members like me and you, share their trading experiences to be able to learn from each other. The episodes are normally produced on a weekly basis to keep members motivated throughout the trading week. ​Regarding the subscriptions, there are no refunds at all. As you have full access all at once after signing up, there is no opportunity to change your mind later. The only opportunity you have if you are not completely satisfied is to cancel your subscription for it will not be renewed automatically and for you will not have to pay for another cycle. Also when you bought one of the educational courses, there will be no chance for a refund. Once you purchase the course, you can download it, you have it and you cannot give it back later. When you buy Physical Merchandise products from ClayTrader, there will be no refunds either. You have to make up your mind before you place the order because all purchases of this kind are understood as some kind of support for the community. When it comes to the ClayTrader University, you have to remember that there is no guarantee for you will be successful and rich. But if you don't download anything from the website and if you don't feel any kind of progress at all after filling out the interactive study guides, ClayTrader promises to refund the full amount you paid. But what sense does this make? At the end, this is not a customer friendly refund policy. 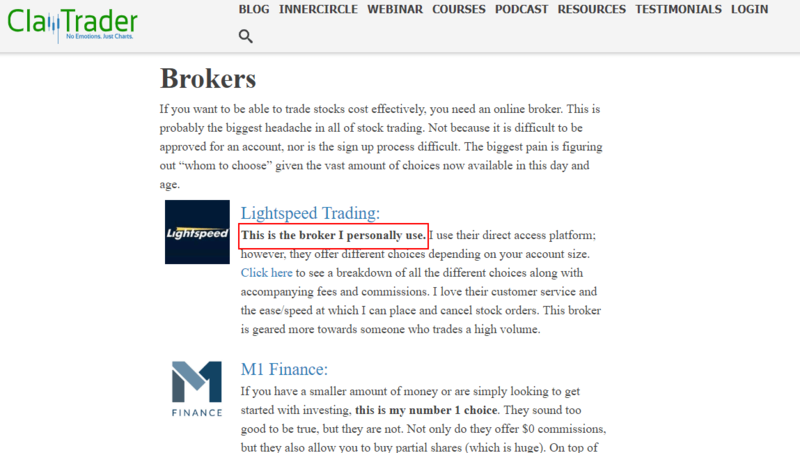 For this review, I searched for public account statements for ClayTrader, but unfortunately, I haven't been able to find any, and so, it is not easy to tell if ClayTrader is truly and completely legit. I honestly have a few complains about the ClayTrader products and services. This service is focusing on marketing tactics. They give standard Technical Analysis terms other names. While you can find most Technical Analysis information for free on YouTube, you do not find anything in the internet when using the terms from ClayTrader. While this approach is understandable for marketing, the next one is definitely not. The biggest fraud for me is the regulation of the money back guaranty. When I hear about a money back guaranty, then I expect that I really have one. But as you can read here (https://claytrader.com/refund-policy/money-back-guarantee/), this guarantee is not a guarantee because there are different aspects that invalidate the money back guarantee. Basically, if you are using ClayTrader’s products and services, then you will not get your money back. However, feel free to read the whole rules yourself. Furthermore, I specifically have an issue with the fact that despite the public outcry regarding his refusal to reveal his full name, Clay continues to provide very little information about him. The much he has disclosed about himself is contained on the platform’s ‘About’ Page and there’s hardly enough information to help understand who he really is. He should address the core details of the company including the year it was started and about himself. The trading educator and trading course business are disreputable enough and the lack of transparency like ClayTrader provides is not helpful at all to let trading courses shine. ​This was the ClayTrader review. I hope it was helpful for you.